Electrician Needed: This device requires a qualified New Zealand electrician to install into the electrical wiring. Auto detects the bulb type making it the best and most compatible z-wave dimmer for LED lighting. The Fibaro module is a highly configurable z-wave dimmer with features such as energy monitoring, auto-off functionality with soft start and memory of the last lighting level settings. Controller for all blinds, awnings, garage doors and gates. 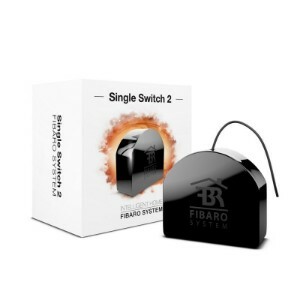 This FIBARO Bypass 2 enables the FIBARO Dimmer 2 module to control loads that are below the 50W minimum requirement. The bypass stabilises the lighting circuit and eliminate the flickering and light constantly on associated with insufficient load on the circuit. Fibaro on / off double relay switch is designed to be installed behind standard wall switch or anywhere else where it is necessary to operate two circuits up to 1.5KW each. Create illumination effect to match weather conditions, your mood or a special occasion. 3 million colours on hand, waiting for your ideas! FIBARO RGBW Controller is one of a kind, advanced wireless 4-colour LED strips controller. Fibaro On / Off Relay Switch is designed to be installed behind standard wall switch or anywhere else where it is necessary to operate an electric device of up to 2.5kW.